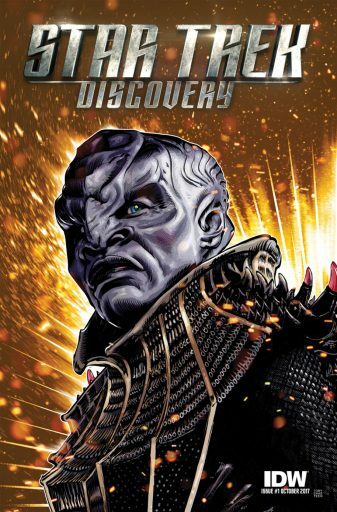 Home » Comics » Star Trek: Discovery: The Light of Kahless #1 Review! Star Trek: Discovery: The Light of Kahless #1 Review! Written by: JediJondee46 on December 3, 2017. Star Trek: Discovery has wrapped up the first part of it’s season on CBS All Access and now IDW is coming out with the comic book developing the instigator for the series. The comic has a cover by interior artist Tony Shasteen, a variant photo cover, and also another variant by J.K. Woodward that has T’Kuvma and a flame that ties into the subtitle. It is written by Kirsten Beyer, author of Star Trek: Voyager books, writer on Star Trek: Discovery and Mike Johnson who worked on the Kelvin universe Star Trek comics and other spinoffs for IDW. Artist Tony Shasteen who worked on a few issues of the Vampire Diaries for DC, the brilliant Occult Crimes Taskforce with Rosario Dawson for Image Comics, and several Star Trek titles for IDW. The comic opens after the first two episodes with the Battle of the Binary Stars. There’s a nice splash of T’Kuvma’s crippled ship drifting in space. Voq, the successor to T’Kuvma has to deal with a restless, hungry crew. He talks with L’Rell who relates a story of the T’Kuvma on the Klingon home world of Qo’nos (Chronos for those non-Trekkers). On the lands of House Girjah, young T’Kuvma runs from bullies, but is caught by his relatives who beat him up to teach him how to be Klingon. He escapes them in the forest and then finds an ancient, abandoned ship in a splash uncut with T’Kuvma entering it. He explores the ship and in one panel looks up to see a shadowy figure against the sun rays coming through the ship, beautiful panel that really uses the lighting effects! Shasteen’s artwork really works in capturing actor likeness (without relying on photo references so much) and bringing something new to the Star Trek visuals. T’Kuvma sees J’ula, a relative who shows him the refuge of former servants. She shows him the lands all given up by his uncle to hold power. Next, J’ula shows him Boreth, where there is a monastery that can teach Klingons about Kahless. He later tells his uncle that he escaped his brothers in the forest. Then, he spars with Khel using the dagger-like D’k tahg. The destiny of T’kuvma uniting the Klingon Empire with the teachings of Kahless will lead him to Boreth, but that may wait until next issue! The expanded material for Star Trek: Discovery fills in the gaps for characters. The novel, Star Trek: Discovery: Desperate Hours by David Mack, covers Michael Burnham becoming Commander on the Shenzhou so this is great in-canon material! This comic works perfectly with the show in story and tone. Four D’k tahgs out of Five!